Led by Joey Votto and his 3-for-3 performance with a HBP, two walks and a home run, the Reds (6-20) scored six runs in the fifth inning yesterday en route to a slug fest 15-9 win over the Twins (8-13). The Reds will try to keep the bats alive this afternoon at 2:10 EDT at Target Field. Sal Romano equaled his season high of six innings pitched against Atlanta on Monday night. He also bested his season high with five strikeouts while limiting his walks to just one. This was huge for him, as he had walked four in each of his previous two starts. However, Romano’s main issue has been at the beginning of each of his starts. He has given up eight hits and six runs in the first inning through five games. After the first, he settles down and has a 1.80 ERA in the third and fourth innings. He might want to change up his pregame routine a little. After spending the majority of his career in Tampa Bay, Jake Odorizzi signed a one-year deal with the Twins in the off season and started well in his first start of 2018. But in his last two starts against the Indians and the Yankees, it has gone in a different direction, as he has given up nine runs in 9.2 innings. Odorizzi has been plagued by the home run ball in those starts, surrendering five home runs combined. Scott Schebler and Scooter Gennett each have a home run off Odorizzi in their careers. -Marty Brennaman has called games in 54 ballparks in his career. That’s a lot of ballparks. With this weekend's road trip to Target Field, Marty Brennaman has now called games in all 30 active @MLB ballparks. -Nick Senzel continues to get better at Triple-A Louisville. Big game for Nick Senzel. He's 3-4 with a walk, home run, 2 runs scored, and has 3 RBI. Over his last 11 games: .318/.412/.523 with 6 walks and 10 strikeouts. Never take Votto for granted, not only for his insane hitting abilities, but also for his personality. In another losing season, he is a ray of sunshine for everyone. The Reds need to win a World Series soon because a) Votto deserves it and b) he would make the parade through the streets of Cincinnati immensely fun. You could have lived at any point in human history, and you get to watch Joey Votto play the game of baseball here and now. The injured pieces are coming back and the trash is being thrown out. I’m really starting to like this team. Win or split every series and good things can happen. Is the new format a punishment for the losing record? Jose Peraza went from -.2 fWAR to .2 fWAR in one game. Bodysnatchers? I think it was an late 80s/early 90s horror movie? Its the only explanation I have for Jose Peraza. Some alien life force took him over and can actually drive the ball instead of just hoping to bloop every pitch to RF. 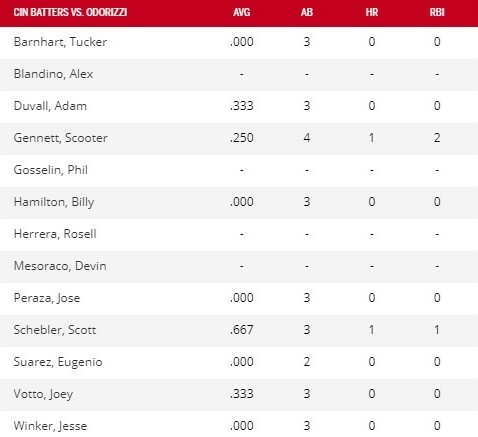 This Reds offense with Winker and ET version Peraza plus a healthy Suarez and Schebler can score some runs! Please go back to the black print on white background. These old eyes can’t read the white on black. My old eyes are using the wordpress.com reader. It misses the bells and whistles but maintains black on white “print”. I’m OK with Peraza betting 2nd right now. He does seem to have a “hot bat” at the moment. Oh, and the format tweak is great except for white on black. Very tough to read. I’d rather have Blandino at 2nd and Scooter DHing with Duvall on the bench. Agree. I hate to see Blandino sit again after he was getting hot at the plate. It’s getting to the point where there is no place for Scooter. I think we should come to realize that the Reds are not going to get a good prospect for him or Duvall. What good does it do to move the journeymen off the 25 man roster if the prospects who take their spots just sit and watch? With the quick turnaround today, I was hoping we’d see Blandino and maybe even Hererra get a start. I guess THE BOOK says to do such things on Sunday but I’m not going to hold my breath that things will be any different tomorrow. Today’s pitchers. An even matchup? Agree about Scooter/Blandino replacing Duvall. IÃ¢â‚¬â„¢m surprised there still so many skeptics concerning Jose Pereza. Pitchers are not going to walk him when Joey Votto is batting behind him. DonÃ¢â‚¬â„¢t let the tail wag the dog. I still hope my pessimism about WinkerÃ¢â‚¬â„¢s defense is misplaced. Romano isn’t missing by much, but trouble here. So, Gameday has every pitch thrown to Mauer at 95 mph. Does Romano have an offspeed pitch? Wow. Brantley and Marty are going OFF on Winker’s defense. Taking him to task for never seeming to go out and work on his defense, shaming (sounds like rightly in this case)him for camping under that fly ball when he knew a runner would be tagging instead of running toward it to build momentum for the throw. Radio crew really going after Winker for defense in this inning, taking too long to get to the double, which allowed the runner to go to third, and then standing flat-foot to catch a fly ball, instead of getting behind the play and having forward momentum to try to throw the runner out at the plate. Brantley talking about poor fundamentals, and not mincing words, and Marty saying he never sees Winker coming out early for extra work, etc. I agree with them. His defense is terrible and we get on Scooter for his. He needs to work on it like Suarez worked on his. He is a good hitter but if somebody coming up in a couple of years is equal to his hitting and better defense , he will be gone. Nice double for Mes. I really hope he gets going, just for his own sake. Thinking the same. Thought for sure it was gone. I just don’t know why he doesn’t choke up and slap the ball on the ground or over the infields heads . He is just a terrible hitter. I know its pathetic!! Just an average 92-93 mph fastball and he can’t do anything. They were right down the middle. Typical Reds….scored 10 in Milw then got shutout 2 games in a row. Odorizzi has been struggling too. I’m glad Peraza is hitting but they need to get Schebler or Suarez in the 2 hole and put Jose 9th. Stick Billy on the bench and leave him there. Let Herrera play CF and DH Winker tomorrow. Billy might save a run or 2 here and there, but he’s so weak witht the bat that its ridiculous. Wow where was Adrianza going? Reds will be trading for him soon. Anybody else get the visualization that when Romano is on the mound, there’s one of those cartoon dynamite fuses, and you just don’t know how long it is until something goes boom? Exactly. When he hits the wall, they can’t get somebody up in the bullpen fast enough. Romano with 1 K today. He’s got to learn a split from Homer or something? Big guy with a live arm but his breaking stuff needs alot of work. He just doesn’t throw it….doesn’t trust it. The K was questionable as well. For a guy who doesn’t strikeout a lot of batters his pitch count goes up quick. He might be a bullpen guy if he can’t develop a punch out pitch. 1st/3rd and nobody out and get nothing. Yeah never want to pinch hit for Billy there. He’s just creating too much havoc! To be fair Winker didn’t help much there either. Then Scooter with a wth was that throw. Scooter is just brutal out there! IÃ¢â‚¬â„¢m not sure how much more of ScooterÃ¢â‚¬â„¢s defense I can handle. Just trade him now for a A ball prospect. His offense can’t make up for his lousy defense. Why have coaches not told Scooter to stop sidearming throws? Brice and Floro keeping us in the game. I like Floro. He has pitched well. 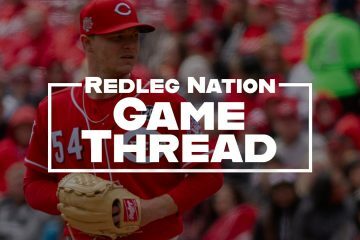 Just checked and other than Shackelford, Brice’s 3.45 ERA is the HIGHEST of any reliever currently in the Reds bullpen. No idea why they don’t DH Scooter in the AL parks. His defense is horrendous. Sit Duvall or Hamilton instead. Hamilton should never, ever bat right-handed. I don’t see how Scooter,Duvall and Hamilton are on this team after the trade deadline. Get what you can for them and move on. I don’t believe Senzel will be called up until Scooter is traded. Then again it’s the Reds. Pinch hitting for Billy 2 innings to late. Not a bad outing from Big Sal, and good relief pitching from Brice and Floro, Usually the case, score a lot of runs and the next game they’re tough to get.